Don’t forget the sunscreen! Sun damage magnifies substances within skin’s surface that can make the appearance of acne worse and extend its stay on your skin—no thanks! That’s why protecting exposed body skin every day with a broad spectrum sunscreen is so important. Doing so will help skin recover in numerous ways, not to mention look younger, longer. Worried that sunscreen will feel too heavy or slick on your body? 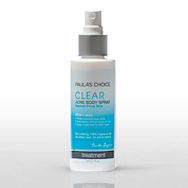 We can’t say we blame you—many sunscreens don’t feel great—but there are lots that do, including our Paula’s Choice Extra Care Non-Greasy Sunscreen, a fluid, antioxidant-rich formula that shields without slickness or shine.